Typically, when one thinks about passion and love this time of year, those thoughts are associated with finding a significant other. I, however, like to think that there are many different types of love that are often overshadowed by romance and can be focused on hobbies and other interests. People who are passionate about what they do have always inspired me, so I decided to focus on some local businesses in La Jolla that are run by people who love what they do. One sunny afternoon, as I was walking around downtown La Jolla with my friend Nia, we came across the Nautical History Gallery & Museum. The small storefront’s door is decorated with different types of knots and an old-fashioned bell to get the attention of the owner, Joe Frangiosa Jr., so he can welcome you to his museum. 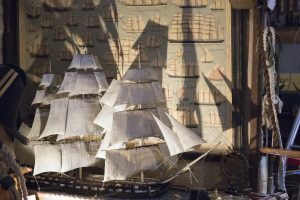 As you enter his workshop, you suddenly find yourself walking through a time capsule full of antiques and intricate, handmade ship models from the 1800s to World War II. I couldn’t help but be reminded of the “I Spy” books that I cherished as a child when looking at the collection of U.S. Navy antiques. It seemed that Joe had everything from cannonballs to coffee pots in his quaint museum, as well as stories and the memories behind each piece. After that incredible experience, I had to go back and find out more about the man who created such a unique and awe-inspiring experience. Joe has always been intrigued with building things that are more complicated than your average Lego set. “As a kid, my first model was when I took door hinges off a dollhouse and attached them to the hood of a toy car, so it was more realistic,” he said. Since then, Joe has always enjoyed drawing and sketching out designs for things. He served four years in the Navy followed by 16 years in the Marine Corps as a helicopter pilot. While serving his country, Joe would find himself researching different ships and designing smaller models. “I didn’t realize it at the time, but it was a form of therapy for me: a way for me to remember my service but also to relax,” he said. One of the most interesting parts of the Nautical History Gallery & Museum is the incredible amount of effort that goes into the models. It starts with a lot of research and sketches that Joe does himself. Then, he builds a wooden frame to get the basic shape of his models started and slowly replaces those placeholder pieces with more accurate and durable ones over the course of six months to ensure it is as authentic as possible. What I like best about this process is that where I would see shoe anklets and door knobs, Joe sees portholes and helms. 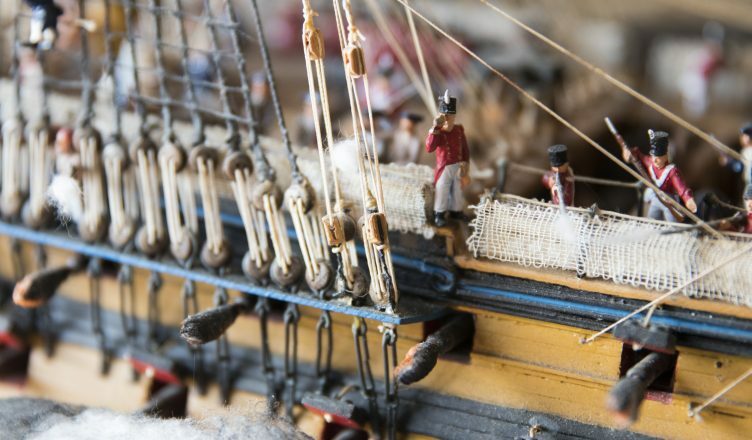 He turns odds and ends from hardware and crafts stores into a unique mini-model of history. There is also Joe’s extensive collection of U.S. naval memorabilia. After his service, Joe started collecting pieces of U.S. Navy history to share his appreciation of the past with others. Some pieces include a bayonet that’s almost 6 feet long and small airplanes. Through this collection, you can also see how many pieces evolve over time. Joe’s favorite pieces that have evolved are the hats. His prized piece is a Prussian-era helmet from the 1800s that took him over two years to find. As you look around the room, you can see different styles of hat, like the po’ boy and traditional sailor caps, as well as more modern ones, like Joe’s own helmet. The amount of genuine passion and appreciation that Joe has for his work is both incredible to his visitors and inspiring for people who want to do what they love. Supporting local businesses and craftsmen is always important because you never realize how much talent and potential is right around the corner. My final question for Joe was how the UC San Diego community can give back to him and others like him. “I just need more media attention. 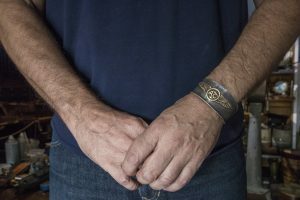 If I can get noticed by younger people who are curious and love history, or donors who I can make specific models for, I really can expand and show off more [of] my collection,” he said. So if you find yourself exploring downtown La Jolla, I highly recommend giving this storefront a visit for the aesthetics and the wonderful craftsmanship. For more details and contact information be sure to visit Joe’s website at http://www.nhgallery.org/ or his free Museum at 1012 Pearl St., San Diego, CA.